Secret Service and police clear Lafayette Park after an anti-tax protester allegedly throws something at the White House. 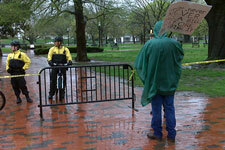 The tea party at Lafayette Park across from the White House is over. The Secret Service and park police broke up the anti-tax revelry after someone allegedly threw something over the fence toward the White House. Organizers asked protesters not to give the cops a hard time and the crowd dispersed peacefully. Update: Now that I'm back from the very cold rain, here are a few more details on the end of the tea party. When police started telling protesters to head up to H Street, on the north end of the park, some of them yelled back at the cops. "Tough guy," one protester in a Navy hat shouted at the uniformed Secret Service agents clearing the square. "He wants to walk the dog in the front yard," a woman yelled out, referring to President Obama's new puppy, Bo. The people in charge of the tea party told the crowd that the police were only clearing the area "for all of our safety," and asked them not to harass the cops for "following their protocol." (That protocol, apparently, included locking reporters who were at the White House for the afternoon briefing into the West Wing.) The protest was set to end about 30 minutes after police cleared the park; organizers said the Secret Service had told them it might take hours to open the space up again, after agents checked the package thrown over the fence to make sure it wasn't hazardous, so they called the whole thing off a little early. And with that, the hardy anti-tax rebels who were still out in the miserable weather headed off on their separate ways.